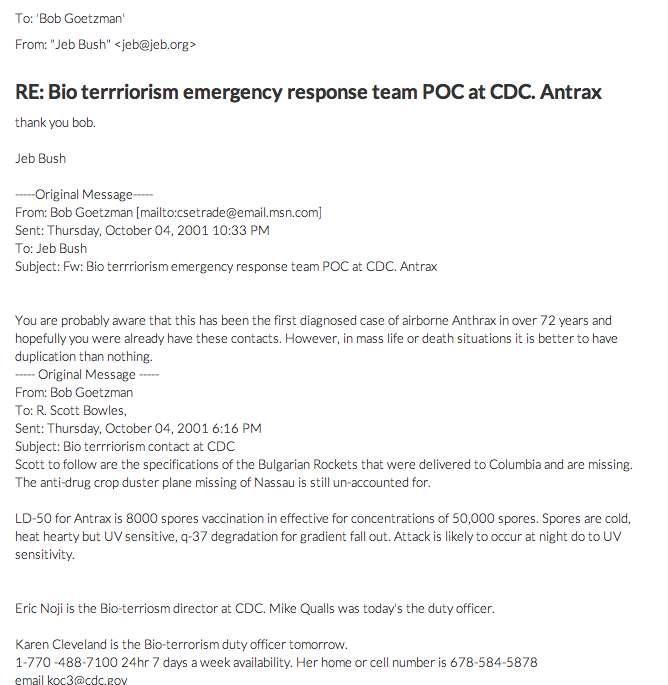 * Jeb Bush publishes October 4, 2001 email explaining that airborne anthrax attack is likely to occur at night due to UV sensitivity ; the silica in the mailed anthrax protected against UV sensitivity « CASE CLOSED … what really happened in the 2001 anthrax attacks? This entry was posted on February 11, 2015 at 7:17 am	and is filed under Uncategorized. Tagged: *** 2001 anthrax attacks, *** Amerithrax, *** FBI anthrax investigation. You can follow any responses to this entry through the RSS 2.0 feed. You can skip to the end and leave a response. Pinging is currently not allowed. Teledyne Brown is major contractor in field assesment. developed for Gulf War Patriot III high altitude engagement, by White Sands. USF has done extensive research in field and has Go4 inventories.